Price Reduced * *HIGHLY APPOINTED CUSTOM ESTATE HOME LOCATED IN THE EXCLUSIVE WILDFLOWER ESTATES. Builder is known for exceptional detail. Beautiful city light views, venetian plaster throughout and a huge guest casita with separate entrance in the entry Courtyard that includes 2 rooms. 12' foot front door hand carved solid Mahogany and hand carved cabinets in kitchen and bathrooms are a must see! Many natural materials such as stone flooring, granite, marble and wood. 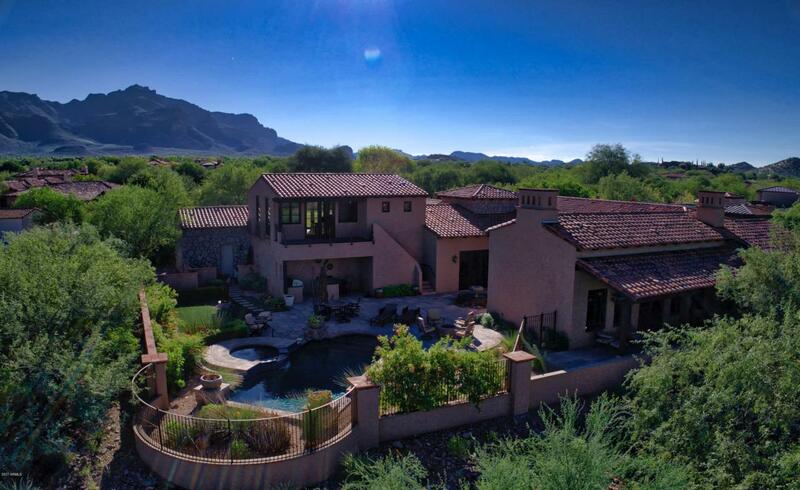 Located just 30 minutes SE of Scottsdale, Superstition Mountain Golf and Country Club is A Great Place to Live & Play! 50,000 sq ft Tuscan style Clubhouse, 2 Nicklaus designed 18 hole golf courses, tennis, Sports Club and pool. Available furnished with agreed purchase price.